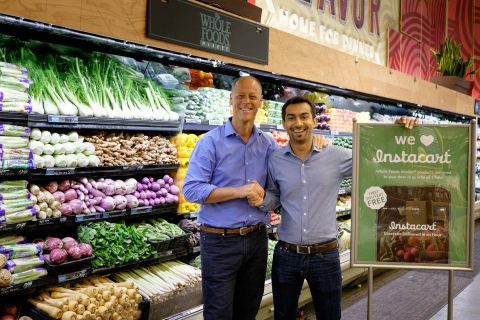 Whole Foods Market (NASDAQ:WFM) and one-hour grocery delivery service Instacart announced today a new partnership that enables customers to have Whole Foods Market products delivered in as little as one hour. Customers will soon also have the convenient option to place orders via Instacart and pick up their order at a local participating Whole Foods Market store. The two companies will pilot the in-store pickup option at select Austin and Boston stores in the next month. Instacart delivers from Whole Foods Market in all of the 15 cities it currently serves: Atlanta; Austin; Boston; Boulder; Chicago; Denver; Houston; Los Angeles; New York City; Philadelphia; Portland, Oregon; San Francisco; San Jose; Seattle and Washington, DC. In the coming months, Instacart and Whole Foods Market expect to expand the in-store pickup option to all of the cities Instacart serves. Through its partnership with Instacart, Whole Foods Market can offer its customers the convenience of delivery without having to handle the logistics themselves. Instacart and Whole Foods Market expect to build on this foundation of services in the coming months to create more solutions for simple, convenient online grocery shopping, delivery and pickup. By ordering at Instacart.com or via the Instacart mobile app, Whole Foods Market customers simply select their zip code, add items to a virtual cart, and then choose a delivery window (within one hour, within two hours, or at a scheduled time) and check out. Instacart Personal Shoppers confirm incoming orders on their smartphones, shop for the items at Whole Foods Market stores, and then deliver orders to customers in the designated delivery timeframe. Via Instacart, Whole Foods Market customers can save grocery lists for fast, easy shopping and automated ordering of regularly purchased products. Instacart also offers a Whole Foods Market recipe database and other great sources with the ability to auto-generate grocery lists for those dishes for Whole Foods Market customers. To celebrate the partnership, Instacart and Whole Foods Market are offering shoppers the chance to win free groceries for one year. Customers will receive hidden game pieces in Instacart delivery bags beginning September 12th, with five chances to win. For complete details visit http://wfm.com/instacartgiveaway. All Instacart customers receive free delivery on their first order; thereafter, the cost is just $3.99 for two-hour delivery or $5.99 for one-hour delivery. Customers can also purchase a $99 annual Instacart Express membership and receive free delivery on any order over $35. Founded in 1980 in Austin, Texas, Whole Foods Market (wholefoodsmarket.com, NASDAQ: WFM), is the leading natural and organic food retailer. As America’s first national certified organic grocer, Whole Foods Market was named “America’s Healthiest Grocery Store” by Health magazine. The company’s motto, “Whole Foods, Whole People, Whole Planet”TM captures its mission to ensure customer satisfaction and health, Team Member excellence and happiness, enhanced shareholder value, community support and environmental improvement. Thanks to the company’s more than 85,000 Team Members, Whole Foods Market has been ranked as one of the “100 Best Companies to Work For” in America by FORTUNE magazine for 17 consecutive years. In fiscal year 2013, the company had sales of $13 billion and currently has more than 390 stores in the U.S., Canada and the U.K.
Instacart is the only service that can deliver groceries on demand from multiple stores within an hour. Founded in San Francisco, Instacart is now available in major cities across the US, delivering from both local grocery stores and national chains such as Whole Foods Market, Safeway, Shaw’s, BJ’s Wholesale and Costco. Using an innovative crowdsourced approach, Instacart relies on a pool of thousands of trained Personal Shoppers who empower stores to deliver groceries to customers in a fast and cost-effective way. Learn more at www.Instacart.com.